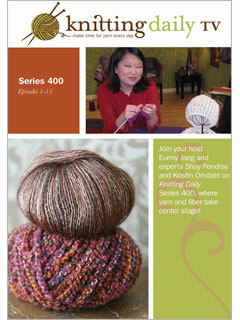 This four DVD set contains Episodes 1-13 of the Knitting Daily TV Series 400 with Eunny Jang as the host. While the show is mainly a knitting show, they do include crochet segments and many other segments provide discussions that can be used for either crochet or knitting (getting items to fit, recycling yarn, fashion, etc.). In addition, they have a “Crochet Corner” segment with Kristin Omdahl. The first episode starts us off with fearless knitting and crochet and covers frogging, ripping back the work, fixing mistakes, recycling yarn, and making items that fit. As a relatively new knitter, I found out just in the first few minutes that I’d been ripping back the work wrong when I’d made a small mistake. “Crochet Corner” starts out with the basics of crochet since it is the first time the segment was aired on the show. Each episode builds on the crochet basics to help you become more proficient in crochet. Even if you are lucky enough to find Knitting Daily on your local PBS channel (which I’m not), these DVDs provide a handy, ready made resource for techniques, designers, ideas, and more. For those who are mainly crocheters, you’ll be surprised how crochet friendly the episodes are. Even when they are talking about knitting, many of the ideas can easily be applied to your crochet work as well.